The (paraphrased) story goes like this: a few years ago, some of the good people of YT were enjoying a quiet beer or three in a hostelry in the Forest of Dean with a few well-known industry types. Mention was made of a new bike they were producing, but apparently they hadn’t quite figured out what to call it. During the conversation, names were thrown about and abandoned, when the nickname of rather handy local rider (and thoroughly nice chap) Phil Jeffs was mentioned. The YT bods looked at each other, eyebrows raised, and lo! The Jeffsy was born. The subsequent Jeffsy 29in trail bike was launched less than two years ago in a blaze of publicity, and has quickly gained a fine reputation as an impressive, 140mm trail-wrangler. It’s available in a wide range of specifications, and (latterly) a 27.5in wheeled model, to boot. The majority of them, of course, are carbon. But there are naturally a few aluminium models in the range too. 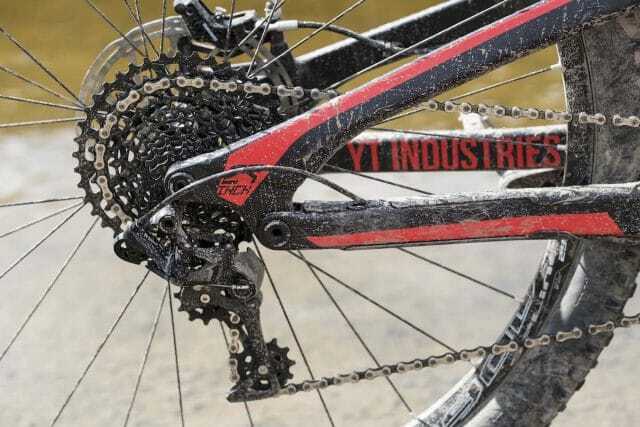 YT Industries offers a 29in and 27.5in Jeffsy, and both come in alloy and carbon frame options. Our test model, then, is the finest aluminium Jeffsy that YT offers. And commensurate with that, it’s a feast of decent specification and nice touches, although in keeping with the value the brand is known for, it’s a meal of the sensible and stoic, rather than the silly. Firstly, let’s talk about the frame. Surprise, surprise, it’s aluminium – air-formed, no less, with YT’s virtual four-link suspension and a 148x12mm back end. A flip chip lets you run two positions, for lairy descending or perky climbing, but I admit I kept it mostly in the slacker mode throughout the test (as befits my personality – arf). The hydroformed alloy frame is bristling with nice details. 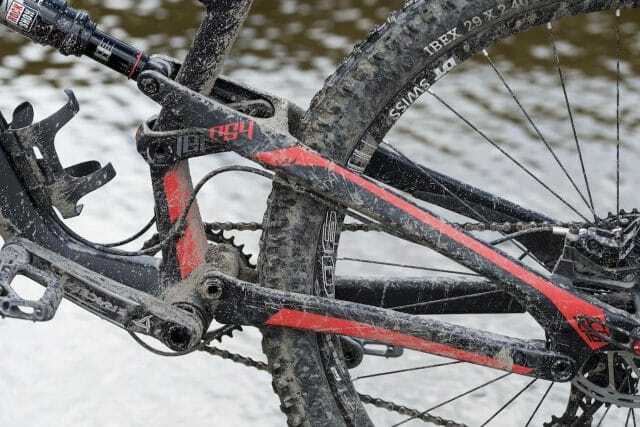 Four-bar suspension out back provides 140mm of travel. 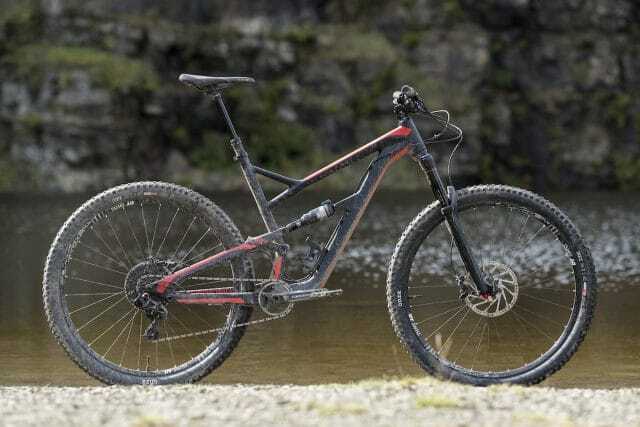 In this guise, geometry-wise, it has plenty of the right numbers for a modern 29er. 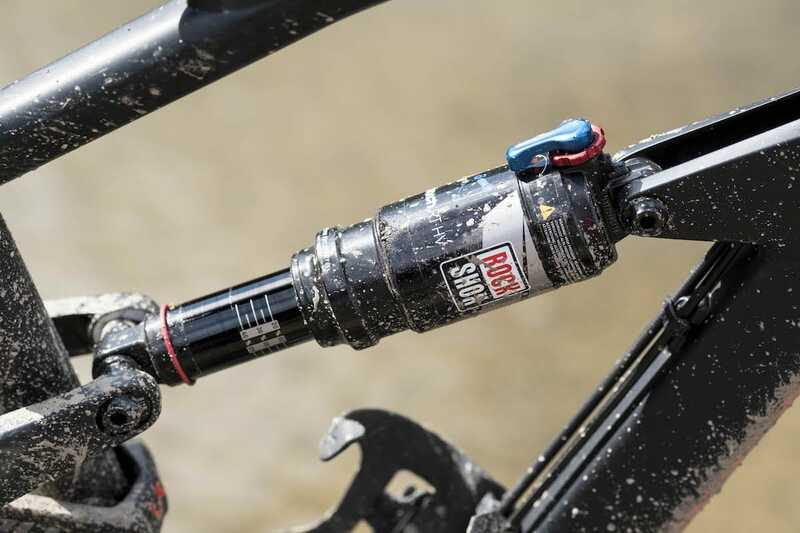 A 67° head angle, a 74.5° seat angle (increase both of these by half a degree by flipping the chip), and on our XL test bike we’re blessed with 637mm stack, a 465mm reach and 440mm chainstays. In the smaller S and M sizes, this last is reduced to 435mm; only the L and XL models get 440mm. This is in an effort to standardise the ride with reference to the size of the rider, which is a laudable effort. Everything else about the numbers looks pretty fine on paper too; everything sits in a sweet spot, nothing is totally extreme. But while a bike is only as good as its frame, there’s plenty of other stuff which can ruin an otherwise perfectly good ride. Thankfully, once again, all of the gear draped over Jeffsy’s lithe form seems to fit the bill. 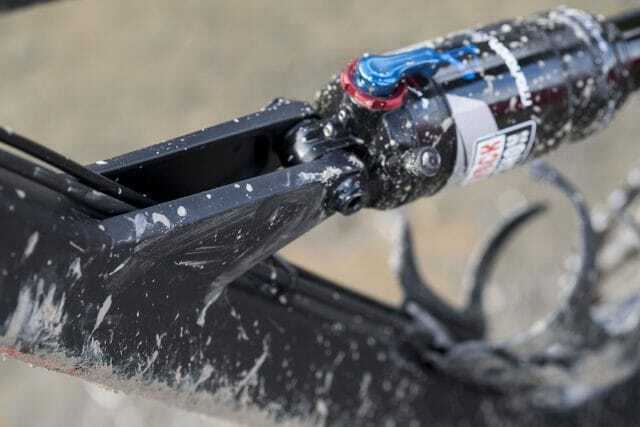 The RockShox Monarch shock gets a High Volume air can. A RockShox Monarch RT shock provides 140mm of cush at the back in a non-metric 200×57 flavour with a two-way open/compression switch and rebound damping. This is mated to a Pike RC at the front, which is also blessed with 140mm of bounciness. 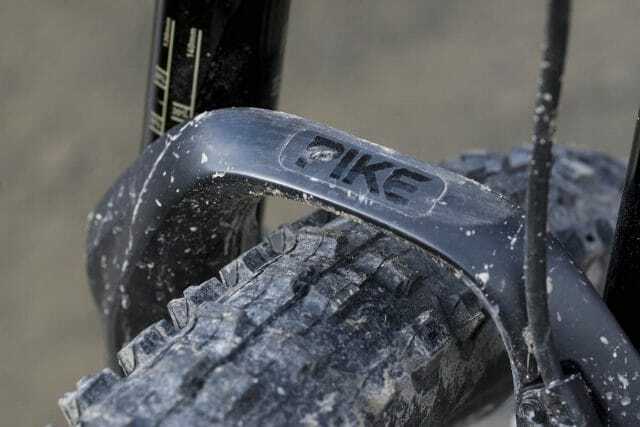 Curiously, although the frame is Boosted to keep with the modern trend for flared back ends, the Pike is firmly entrenched in the drainpipe trousers of a non-Boost 100mm dropout width. 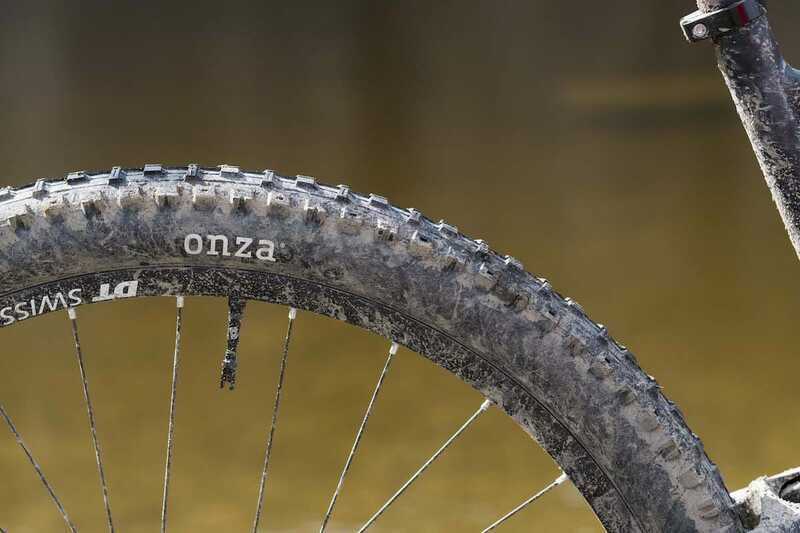 Onza Ibex tyres are superb. The DT Swiss rims are too narrow though. Even at this price you’re getting SRAM X1 components. Wheels are the sturdy DT Swiss M1900s, with a surprisingly narrow 22.5mm rim diameter, shod in Onza Ibex 2.4 tyres front and rear. The whole shebang is propelled with a SRAM 1×11 (de rigeur these days) drivetrain; X1 shifter and rear mech drag the chain across a cost-saving 10-42 GX cassette at the back. Cranks are Race Face’s excellent Turbines with a – ahem – constitution-enhancing 32T chainring. Stopping is delegated to SRAM’s Guide RS brakes with an encouragingly substantial 200mm rotor up front and a 180mm rotor out back. 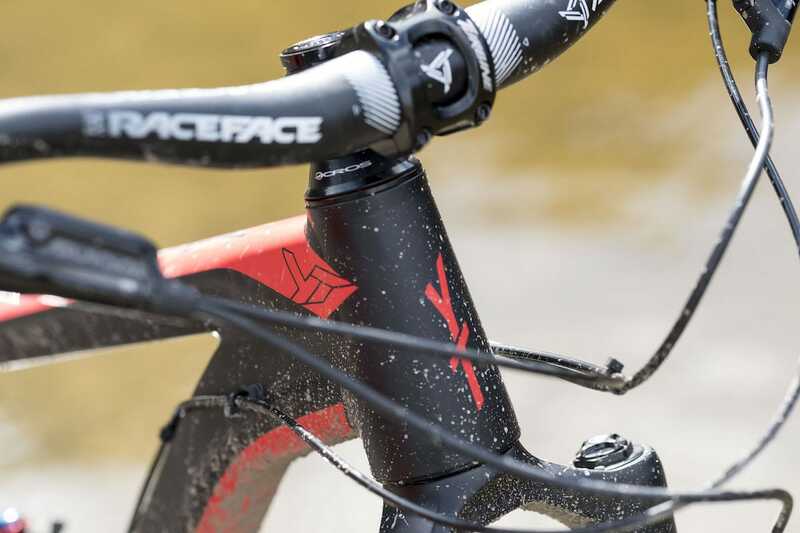 An e*thirteen dropper post with 150mm of give (125mm on the smallest Jeffsy) keeps an SDG Fly saddle aloft, and the cockpit also comes courtesy of Race Face: a 60mm long stem (50mm on the S and M sizes) and decently wide 770mm wide bars. So, let’s pop a spot of air in the shock, some in the fork and a little in the tyres, and hit the trail. It isn’t the longest bike, but the cockpit still feels nice and roomy. The bike instantly seemed centred and comfortable. No, the reach isn’t the longest, it’s slightly below average for an XL bike in this day and age, but the cockpit felt roomy. Granted, the stem’s about as long as I felt comfortable with, but the width, rise and sweep of the bars worked well with it to give me enough breathing room. 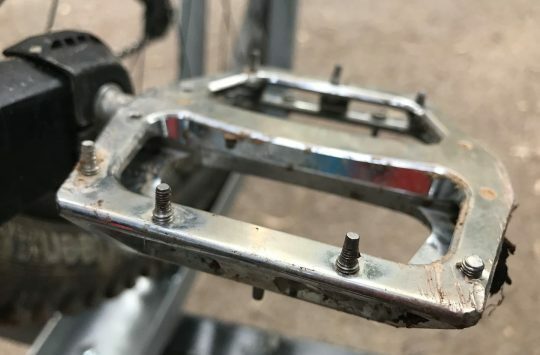 There’s a certain amount of pedal bob when the shock is left in the open position, which was disconcerting only at first – the suspension is progressive enough with little enough feedback that it was more of a visual issue than a physical one – and in any case, it was ameliorated by the simple act of switching the climbing circuit on. I’d have liked to see a little more compression adjustment available on the shock to fiddle with the settings a bit more, but this is a common gripe with me and the Monarch RT. It’s a great shock in all other respects though, so I’m not going to get gloomy about it. I just punted the platform circuit on when the climbs became long and draggy. No problem. You’ll want to reach for that blue climb switch. Speaking of climbs, the Jeffsy does them extremely well. Even in the slack setting I left the bike in most of the time, the seat tube is steep enough that I never felt I was falling over the back, no matter how steep and techy the climb got. Combining this with the long(ish) chainstays, the bike generates commendably little wander from the front end either; it just gets on with the task at hand. The only fly in the ointment was that 32T chainring. For prolonged climbs or eyeball-burstingly steep ones, it’s pretty stout. I found myself wishing for an extra gear more than once. The progressive suspension also helps the bike hurtle forwards like a greased ocelot if you need to quickly stamp on the pedals – helped by impressive lateral stiffness, and so it’s got a fine turn of speed on techy trails too. 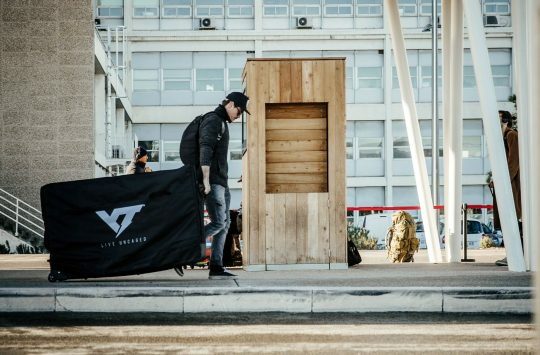 This is one of those bikes that emphatically doesn’t ride its weight. Which is a good thing; it’s not the heaviest bike, but the frame and build kit are made for strength, stability and fun, not gossamer featheriness. This is all to the good in any case. The progressive suspension rate helps the Jeffsy to speed forward when you’re on the gas. Cornering feels direct and predictable; and even in the slack position there’s a playfulness I frankly wasn’t expecting. There’s that low BB, more than enough room in the cockpit to play around with weight placement, and it’s easy to unload the back end to spring it round the tightest of turns with a startling amount of momentum. And what of descending? Well, that is a whole pile of entertainment. The e*thirteen post worked flawlessly throughout the test (I loved the grip-tape on the trigger) and lets you hurtle into the gnarly stuff with nary a pause. Barney wasn’t expecting the Jeffsy to feel so playful in the turns. 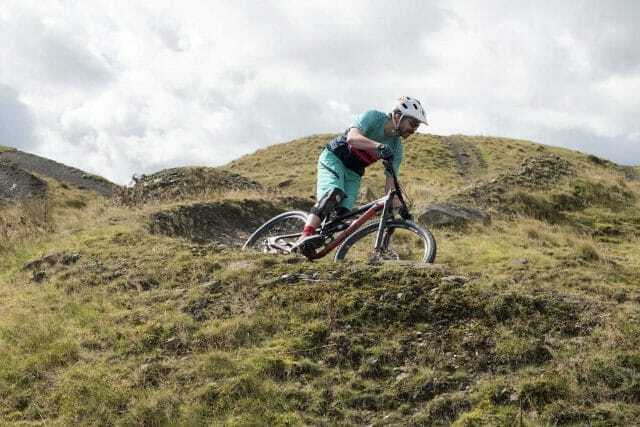 I was lucky enough to spend a couple of days with the Jeffsy in the Scottish Highlands, riding some of the techiest new descents I’ve encountered in quite some time, and the bike acquitted itself superbly. From fast singletrack that quickly became rather lairy (I was glad of the 200mm rotors) through to buttock-clenching steep rolling, steppy, rooty drops and large hucks, in the wet and dry, the Jeffsy was extremely capable, predictable and confidence-inspiring. There’s a slight feel of give in the wheels compared to some of the wider rims I’ve ridden recently, but it’s a difference, not really a flaw – unless you’re really bashing into things at high speed. Speaking of which, the progressive nature of the suspension does means it can get fazed in repeated big hits, so, it’s not a fire-breathing plough-over-everything monster – you do actually have to pick lines and ride it rather than just shouting “Raaaaargh!” and holding on, but the ride is all the more satisfying for all that. 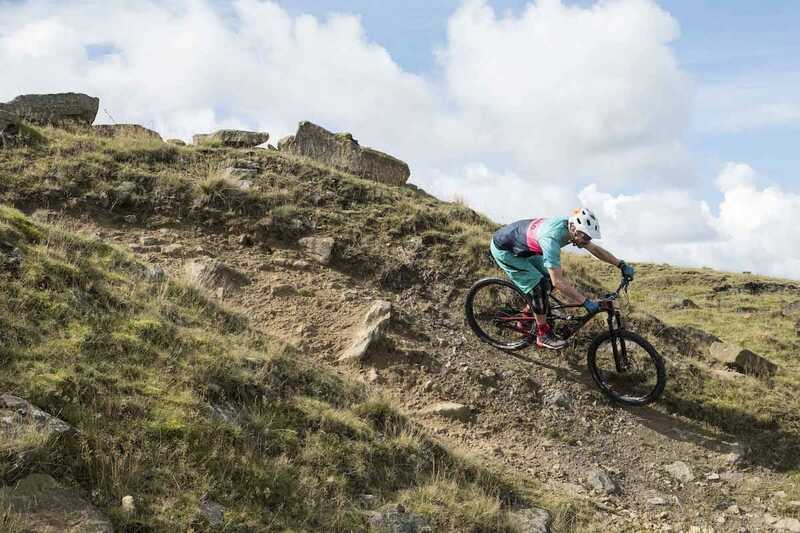 The Jeffsy loves technical descents. The Jeffsy in its aluminium guise is an extremely impressive setup. Granted, you gain a couple of pounds in weight, but for all that the bike doesn’t ride like it. As soon as you get on it, you’re rewarded with a perky ride which is pretty darned impressive whatever you fancy riding. It’s a pretty progressive suspension setup, that feels nicely bottomless, although if you’re encountering fast, repeated hits it can get overwhelmed. Pretty much everwhere else, though, it shines. Great on the climbs, fun on the descents no matter how lairy. Is it really worth going for the carbon over the aluminium model? 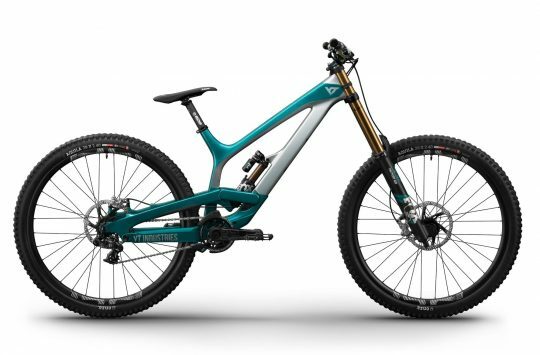 Well, that’s for you to decide – but the alloy Jeffsy is every bit the excellent bike its more expensive plastic cousin is. 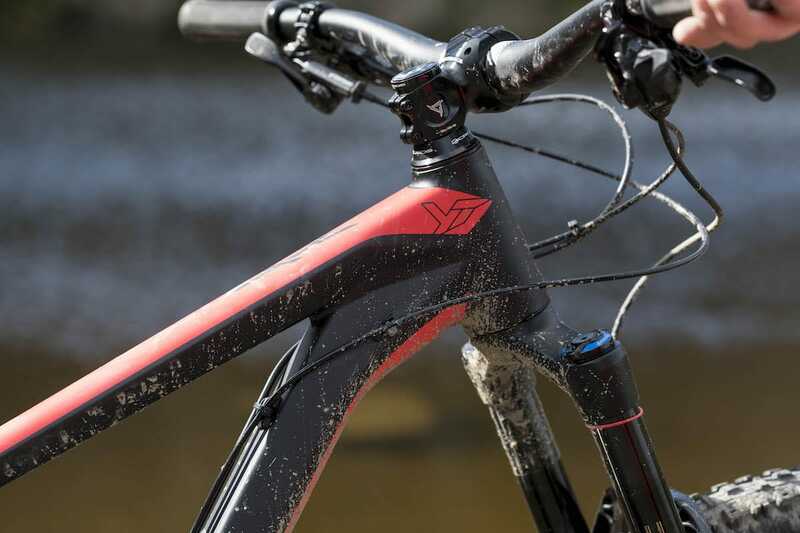 Note: YT Industries has since updated its Jeffsy line with new spec options and new pricing for 2018. Head to the YT website to see the current range of bikes. It isn’t as light as the carbon version, but it’s a damn sight cheaper, and it rides mighty well too.